All I can tell you is that the paper isthe Irish Independent. That could be just a line under the sign Rocker but possibly an arrow. I'd guess in the 50's? When were those Tram rails and cobble stones dug up from the main street? And in older photos I've seen the tram rail splits there and goes down Marine Road, but not in this photo. I just LOVE old photos of Dun Laoghaire. Thank you for putting this photo up. Can you see the shops in the original? What is the shop beside Mays? I also never noticed the ballistrade gone until Rocker pointed it out. What is the large pole on the RHS? top type carraige or something like that? 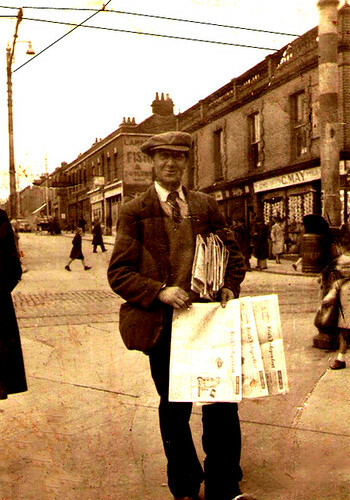 Great Photo the paper seller may be Mr Scully who lived in Sallynoggin but that depends on what year ,it is not Scoop but the face is of a man who lived in Mary St or Cross Avenue cant think of a name just now . Denis may know better . is now part of the telephone co. shop. Oh Sinead.....all I can see are pole dancers of a certain vintage cavorting around....you are going to have to clarify...what was the pole for?? She was there to serve the customers, silly! There was a pole in the centre of the shop. Wasn't it a suporting pillar in the middle of the entrance to the shop. I think it was covered in small ceramic tiles like a mosaic? HID is adding his tuppenceworth...he remembers as a child cutting off the corner by running behind this entrance pole...taking a short cut as it was out on to Georges Street. That's right Rocker, there was no corner as such and the pillar supported the entrance over the shop. I'm sure I've seen a photo of it....somewhere. 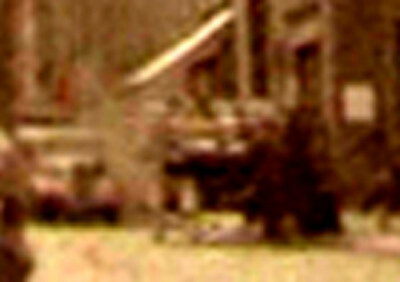 Look for old photos of the fire in St Micheals, maybe in one of them. Or Gulliver may (no pun) have one. Lads, Sinéad was talking about a pole in the center of a ladies' outfitters shop next door to Mays. I think yiz are correct about a supporting pillar on the corner of Mays, wasn't there a kind of entrance porch? O.K that is a photo of my Uncle Mick...I didn't put his name up as some of the extended family members might not like me even putting up the photo. He was born 1903 and I'd say he was about 40 in the photo which would put it sometime early 40's . I was just intrigued the other day when I got the photo about the number of items in the background, shop fronts, people cars etc. He did live on Patrick Street.......a character to boot!. ... well read, brains to burn .....talents unrealised. they were the supports for the upper floor of the building. the pole outside Duckey Mays. Great photo, thanks for sharing. 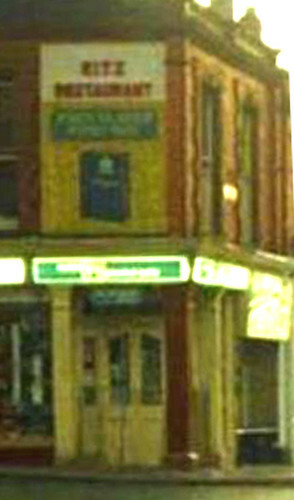 skins wrote: Lads, Sinéad was talking about a pole in the center of a ladies' outfitters shop next door to Mays. I think yiz are correct about a supporting pillar on the corner of Mays, wasn't there a kind of entrance porch? Ah sorry didn't know that. Cheers Skins. Found one of the corner pillar. 1979. Nice to see the photo of mays,it looks closed always remember it bursting with goods hanging all over the place. Strum - that is not the corner pillar inthe first photo. The one in the first photo looks like a metal pole. When I was a kid it was always a concrete Pilar NM, just like the photo. The entrance was renovated a few times and I think 02 put the metal one in a when they opened first? I think the one you mean is a tram/telegraph pole on this side of the road, corner of Marine. The pole I am talking about is the tall pole with stripes around it. It is on the RHS of the photo. Yep NM. That's a lamp post/tramline pole and it's on the corner of Marine road. See the base of it at the little girl's feet. See that now I thought it was on May's corner. Navanman wrote: See that now I thought it was on May's corner.